Gosh it's been cold around here. It has not been nearly as bad as last year, or as bad as they have it on the East Coast right now, but cold is cold and it has been cold. And when it is cold I want comfort food. What that means can vary, often depending on what I have on hand. What I had on hand this weekend was black beans. I associate black beans with Mexican food, but I was not in the mood for Mexican. I didn't know what I wanted, but I was pretty sure it wasn't the usual Mexican flavors. When that happens I will wander over the pantry and look over what I have to see if inspiration strikes. I was lucky this time when my eye fell on about half a cup of vermicelli. It was one of many last little bits of items I buy for a specific purpose and for which I don't use the entire package. So I am always happy when something catches my eye and I immediately realize that I can incorporate it into what I am trying to do and help clean out my pantry. I know beans and pasta go together and form a complete protein for a meal-in-a-bowl, so I knew that was what I wanted to do. I think of vermicelli noodles as comfort food, largely thanks to those packages of chicken noodle soup we always had in the house when I was a child. 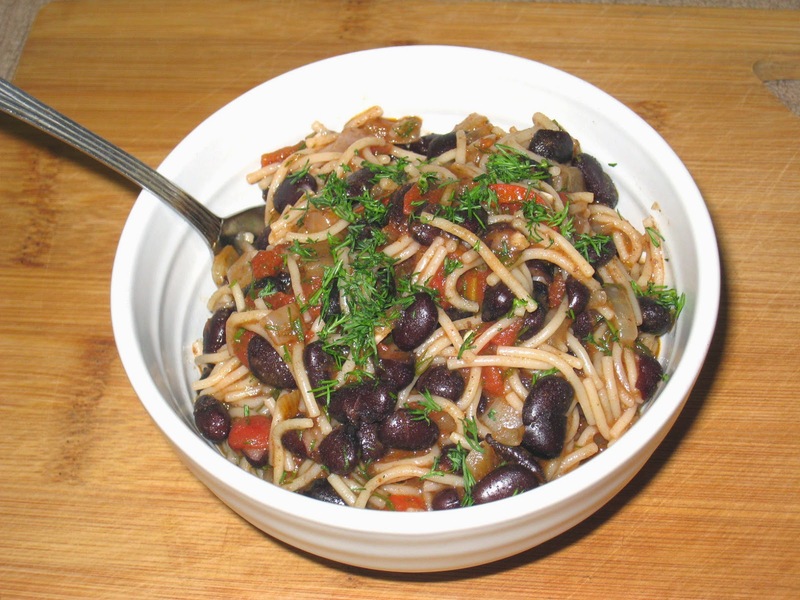 The packaged versions are so loaded with sodium and chemicals that I no longer care for it, but I still have fond memories of that flavor profile so I loved the thought of adding it to black beans for a nice comforting meal for a cold winter's day. This dish came together in about half an hour, which is great for a weeknight. I had cooked the beans the day before because I knew I was going to make something with them and wouldn't have time to cook them from scratch and put together dinner on the same day. That has become one of my tricks for weeknight cooking. I'll decide what beans I will be wanting and I will cook them and put them in the refrigerator until I am ready to use them. And if I haven't found a use for them within three days I throw them in the freezer so they don't go to waste. This makes a lovely dinner with a nice green salad, and travels well for work lunches. Heat oil over medium heat in a large saucepan. Add the onion and garlic and saute until translucent but not browned. Add the wine and cooking, stirring often, to let the alcohol evaporate. Add the vegetable broth, tomatoes and black beans and bring to a boil. Reduce the heat and cook for ten to fifteen minutes to let the flavors blend. Raise the heat to medium-high and bring the mixture to a boil. Season to taste with salt and pepper. Add the vermicelli and cook, stirring frequently, until the pasta is done according to the package directions. Serve immediately, garnished with more of the chopped dill.